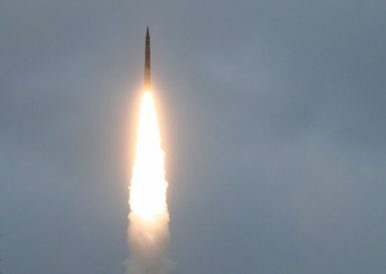 The missile reportedly successfully hit its target in the Kamchatka Peninsula. Russia’s Strategic Missile Force (SMF) successfully conducted a test launch of a silo-based intercontinental ballistic missile (ICBM), the Russian Ministry of Defense reported on January 17. The launch reportedly took place at the Plesetsk Cosmodrome, in Arkhangelsk Oblast, approximately 800 kilometers north of Moscow. The missile hit a hypothetical target at a testing ground on the Kamchatka peninsula in Russia’s Far East. “The missile’s exercise head hit a hypothetical target at a firing range in the Kamchatka Peninsula with high degree of precision. The launch was geared to confirm the stability of flight characteristics of this type of intercontinental ballistic missiles,” the ministry noted in a January 17 statement. According to a video posted online, the missile was fired from a missile silo. The video apparently also confirms that the missile tested was a nuclear-capable Topol-M (aka RS12M2/NATO reporting name SS-27), a three-stage solid fueled ICBM first test fired in 1994 with a reported maximum range of about 11,000 kilometers (6,835 miles). Russia has also been developing an upgraded Topol-M variant, the more advanced Topol MR (aka SR-24 Yars/NATO reporting name SS-27 Mod2) first revealed in 2010. The Yars, reportedly fitted with more advanced decoys and countermeasures than the Topol-M, and featuring a higher speed, has been specifically designed to evade Western anti-ballistic missile defense systems. Both Topol-M variants can be deployed from either missile silos or transporter-erector launchers (TELs). “The Yars will eventually replace older Topol-M models as the SMF’s road-mobile mainstay of its arsenal,” I explained in December 2016. The Topol-M can carry one single warhead with a 800 kiloton yield. The more advanced Yars can reportedly be fitted with four to six multiple independently targetable reentry vehicles (MIRVs). [T]he Russian government announced its intention in 2015 to add around 40 new ICBMs per year (“Russia to Add 40 New ICBMs: Should the West Be Worried?”). The discrepancy between the independent estimates cited above and Karakayev statement could indeed imply that Russia succeeded in increasing its ICBM arsenal. Russia plans to conduct about a dozen ICBM test launches in 2017. Russia’s strategic missile force inducted 80 new ICBMs in the last five years.